In september dit jaar vieren Nederland en Kazachstan hun 25-jarige bilaterale band. Van 10 juni tot en met 10 september 2017 vindt in de hoofdstad Astana de World Expo 2017 plaats. Het thema van de World EXPO 2017, Future Energy sluit aan bij de terreinen waarin Nederland en Kazachstan samenwerken. Nederland is op de World Expo vertegenwoordigd met een eigen paviljoen. Holland’s activities at Expo Astana 2017 are an ode to the Dutch mind-set: Low land, high energy. The Dutch have been battling water for centuries. Over time, the country’s geographical position below sea level and the confrontations resulting from this formed the famous Dutch mind-set. It made the country collectively push back the waters and reset its frontiers. Making way for a creative breeding place with an energy which is both thriving and unique. Always in the typical Dutch way: open, exploratory, cross-pollinating and purposeful. The World Expo 2017 is an International Exposition currently taking place from June 10 till September 10, 2017 in Astana, Kazakhstan. The expo’s theme is Future Energy, and aims to create a global debate between countries, nongovernmental organizations, companies and the general public on the crucial question: “how do we ensure safe and sustainable access to energy for all while reducing CO2 emissions? Among the commercial pavilions, the Hall of Energy is situated; a multifunctional performance venue with hi-tech audio equipment for chamber concerts and art performances. The auditorium is designed for 1,000 seats. By virtue of the revolving floor and stage technology, the platform, by uncomplicated manipulations, turns into a venue for official events: ceremonies, receptions and banquets. The Exhibition theme ‘Future Energy’ will be presented in four thematic axes. Accordingly, allocation of four large sites in the Exhibition area for the thematic pavilions is provided for by the General Layout. The sites may be connected with each other, overlap the area of adjacent outdoor areas and public space by means of the so-called ‘Thematic Itineraries’. Special thematic design has been provided for in these areas and placing of the according information on the subject, related to solution of what is the sustainable mode of life and how we can achieve it. At the first Pavilion, the idea will be revealed of how the energy created by the space and Earth can be used by mankind under the conditions of contemporary energy sector development. The basic theme of the second Pavilion will be realization of the problem of global energy crisis which has led to natural resources depletion and environmental pollution. In the context of city planning, selection of the Thematic Pavilions location was caused by desire to ensure maximum space for architectural creativity and organization of the Exhibition inner structure. The Thematic Pavilions will be connected with international pavilions by the Circular Boulevard where daily show parades will take place, and also art performances and installations held. De resultaten van de Holland Innovation Challenge worden met o.a. 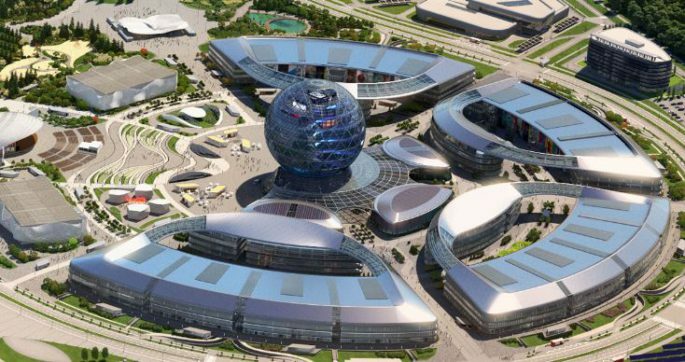 deze 360 video op de World Expo in Astana gepresenteerd. 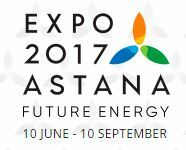 The ASTANA Expo 2017 is being organized in Astana, Kazakhstan, during the months of 10 June – 10 September 2017, under the theme “Future Energy,” with three sub-themes: Reducing CO2 Emissions, Living Energy Efficiency, and Energy for All. The expo aims to concentrate on the future of energy, and on innovative and practical energy solutions and their impacts. The Thailand Pavilion or “Sala Thai” is now completely ready to welcome visitors from 115 countries around the world. The Thailand Pavilion is organized under the theme “Bioenergy for All,” which aims to convey to visitors the message of a future with sustainable energy and Thailand’s potential for developing alternative energy. It will also present the advances in developing bioenergy that grew out of the initiatives of H.M. King Bhumibol, or “Father of Thai Energy.” During his lifetime, his work in many royal projects had made a great impact on the overall energy development nationwide. The pavilion is divided into three exhibition halls. The first exhibition hall is “Our Ways, Our Thai,” where visitors will witness the Thai ways of life and our unique, natural land and cultural beauty, together with developments in alternative energy, through a live exhibition. The second hall is “Farming the Future Energy,” which will present the concept of the Thailand Pavilion via 3-D theater. The third hall is the “Energy Creation Lab,” where visitors will discover, via an interactive exhibition, how bioenergy and biomass are derived from nine energy crops. The Minister of Energy, Gen. Anantaporn Kanjanarat, presided over Thailand’s National Day at the expo, taking place on 1 July 2017, and stated that Thailand is ready to showcase the country’s potential and advancements in turning agricultural waste and residue into value-added renewable energy, which will not only support the realization of the Thai government’s energy strategies toward energy security, prosperity, and sustainability, but also contribute to the global effort in battling climate change.